Leaving from Bruxelles, follow the road to Namur (E411), and then Liège (E42) an take exit n° 7 Huy-Fumal, in the direction of Huy. Leaving from Liège by Motorway, follow the road to Namur (E42), and take the exit to Villers le Bouillet, in the direction of Huy. 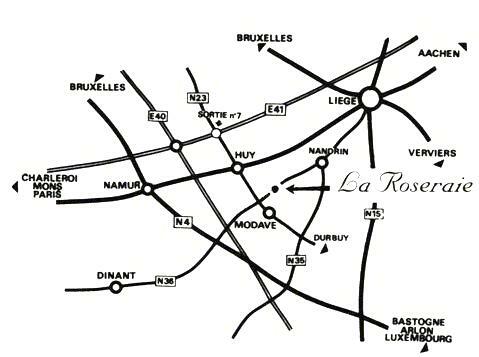 Leaving from Liège by the Route du Condroz, RN63, at the junction of Nandrin, take the road to Modave (RN636). Leaving from Namur, follow the road to Liège (E42), at exit 6 Huy-Fumal, towards Huy. Leaving from Huy, follow the road to Modave (RN641). Leaaving from Marche en Famenne, follow the road to Liège (RN63). Take the exit to Modave (RN641). Leaving from Dinant, follow the road to Ciney-Havelange (RN97), then the road to Modave (RN636).